You’re in Paris: your dream destination. You want to see everything and explore everything. Paris has one of the best public transportation systems in the world and you can’t miss the chance to live the city like a local by using it. 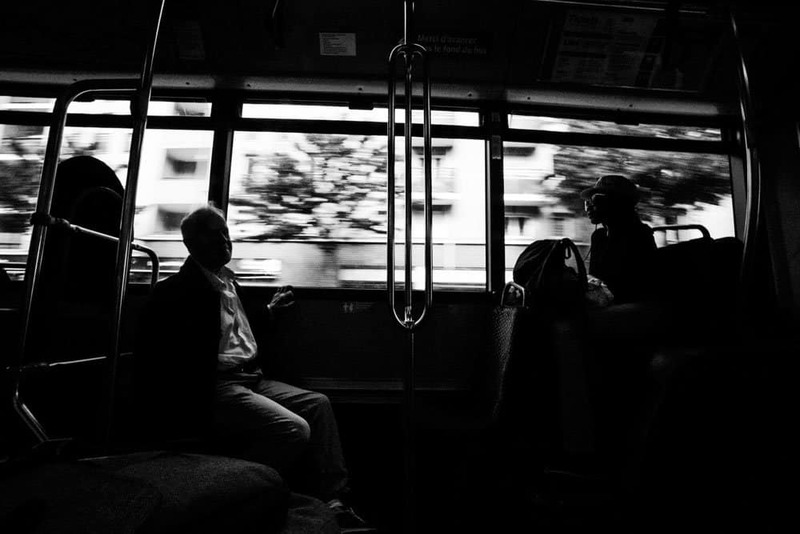 As always, when you get to a new city, it may be unnerving to use the public transportation. You may feel lost (or GET lost) but don’t worry: it’s all part of the experience. That’s why we created this guide, so you can use the public transportation in Paris and feel safe while doing it. There are many ways you can move around the city: metro, RER, bus, and bikes. Let’s explore all your options! The great thing about metros is that they work similarly everywhere. 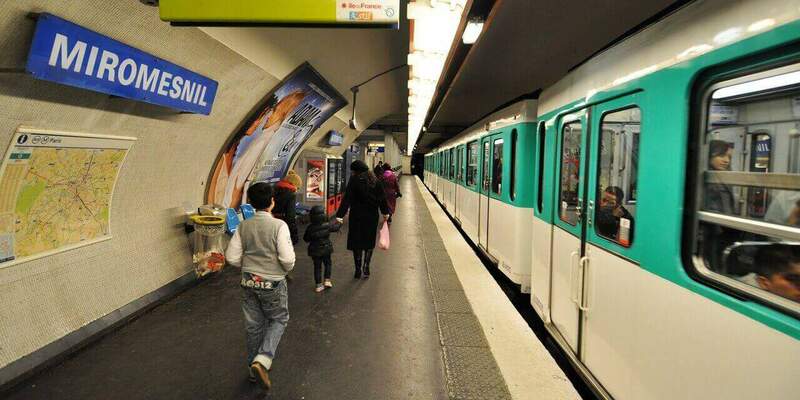 If you’ve used it in your city, Paris’ metro is not that different. There are 16 lines and some 300 metro stations. Here you can see a map of all the metro lines in Paris. 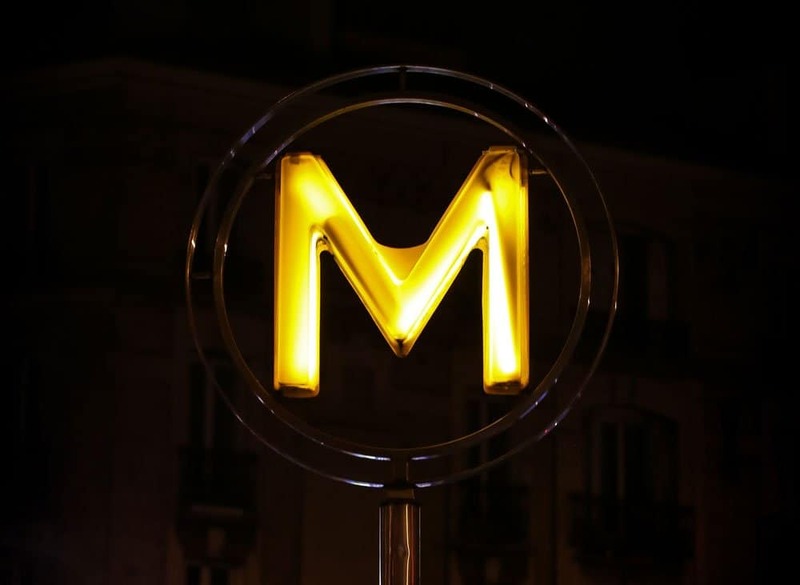 You can identify the entrance of the metro stations in Paris by a big yellow letter “M”. The metro schedules in Paris are these: Sunday to Thursday (including public holidays) from 6 am to 12:45 am, Friday and Saturday (including public holidays) from 6 am to 1:45 am. The metros run depending on the time and day: at peak hours they run every 2 minutes. How much does the Métro in Paris cost? A single ticket costs €1.90 and it’s valid for zones 1 and 2. Zones 1 and 2 in Paris comprehend the center of the city. The tickets get you to the end of each line even if that metro station isn’t inside the zones 1 and 2. You can use this ticket for a single journey, including connections. Depending on how you’re gonna use the metro you can buy a single ticket or a book (carnet) of 10 tickets for €16. You can buy them at the ticket offices or machines in metro stations, also in some tobacconists. Important: keep your ticket until you’ve completed your journey since you may be asked to show it if tickets are inspected. If you don’t have it you may be subject of a fine. The most overcrowded lines in Paris are lines 1, 2, 4, 11, 12 and 13, especially at rush hours. If you want to have views of the city take lines 2 and 6 because they run mostly above ground. Line 6 offers views of the Eiffel Tower. The RER is a network of trains that has 5 lines and serves Paris and Ile-de-France. Same as the metro, each line has its own color that’s shown on the RATP and SNCF signs and maps. It’s also air-conditioned, perfect for the hot summers in Paris! Check all the lines here. It functions almost the same as the metro in Paris, it just doesn’t stop at every stop, which makes it faster. The only thing you need to do differently is to put your ticket through the automatic barriers when you’re going out. And what’s better, if your RER station has a connection with a metro station, you can use the same ticket for the whole trip. The cost of the tickets, if you’re staying within the city limits, is the same as the metro. The RER stations also have ticket offices and machines where you can buy the tickets. These RER tickets cover trips and any connections within Paris (zones 1 and 2) on your outward and return journeys. Take the RER B to go directly to de CDG airport. This network of trains starts running at 6 am and stops at around 12:45 am every day. This includes public holidays. Important: if traveling beyond city limits, check that you have the right ticket or pass that covers the whole journey. If you don’t have it you won’t be able to go through the automatic barriers (believe me, it happens and it’s awful!). You may also have to pay a fine. If possible, avoid the RER (and metro) at rush hours: 8 am to 10 am and 5 pm to 8 pm. These trains depart from major Paris train stations such as Nord, Est, Lyon, Austerlitz, Montparnasse and Saint-Lazare. The tickets for the Transilien can be bought at Ile-de-France ticket desks and machines in train and metro/RER stations. Check the routes here. Paris also has 8 Tramway lines that you can check here. You may use the same RER tickets for the Tram. There are 64 bus lines available in Paris (check all of them here). When taking the bus, you can see the line number and the direction in front and on the sides of it. To stop a bus in Paris you must put your hand out so the driver stops. Something great about bus stops in Paris is that there are electronic display signs that indicate how long you’ll have to wait for the next bus. They also display the first and last bus in service and the frequency at which the buses get to the stations. And some are even equipped with USB ports to recharge your phone! Buses run from Monday to Saturday from 7 am to 8:30 pm. The lines that depart from stations or serve metro/RER interchanges operate also in the evening from 8:30 pm to 12:30 am. There are also lines that operate on Sundays and public holidays. The most crowded bus lines are 28, 38, 62 and 68 since they service the central areas of the city. How much does a bus ticket cost in Paris? The same as the metro: €1.90. And you also use the same ticket (except on the Balabus, Noctilien and routes 221, 297, 299, 350 and 351). The tickets are valid for a single journey with no connections with no limits on distance. So, if you change of bus or connect with another type of public transport, you’ll need another ticket. You can also buy the tickets from the bus driver but bring the correct change. Important: get on the bus at the front and get off in the middle door or the back door. If you’re getting on an articulated bus, you can get on and off through any door (push the button next to them to open the doors). To request a stop, press one of the buttons in the bus, a stop requested light will appear in front of the drivers’ compartment. SUPER important: punch your ticket or validate your pass when you get on the bus. If you don’t and there’s a ticket inspection you may get a fine. This is a night bus service that you can take from 12:30 am to 5:30 am in Paris (and the Paris region). It has 47 lines and you can use the same tickets as in the metro or buses if it covers the zones you’re traveling to. This buses also run right on schedule and you can check the map of the routes here. If you’re worried about traveling that late at night, don’t worry (also follow these tips if you’re a woman traveling solo). The buses have video surveillance and there’s a security monitoring center that’s connected to it constantly. There are also employees stationed at the major connecting stations in Paris, so if you have any question, you can ask them. And here’s the best part: on lines N130 to N154, you can ask an employee to wake you up at your stop! Can something get better than that? I don’t think so! There are special buses that can get you from the airports (Charles de Gaulle and Orly) to and from the city. You can take three different lines depending on where you are and where you’re heading: RoissyBus, OrlyBus, and Orlyval. It connects Paris-Opéra with Charles de Gaulle Airport. The journey time is of 60 minutes approx. – Opéra (on the corner of rue Scribe and rue Auber) to CDG Airport. It has 8 drop-off points: T1-T2A, T2B, T2C-T2D-T2E-T2F, T3 Terminals. – CDG Airport to Paris-Opéra. It has 5 pick-up points: T1-T2BD-T2AC-T2EF, T3 Terminals (formerly T9). It’s a shuttle bus that operates between Orly airport and Place Denfert-Rochereau. The journey time is of 30 minutes approx. The frequency is of 10 to 20 minutes depending on hours. A light rail transit line (that has no driver!????). It connects Orly airports with Antony RER station. You can take the Orlyval every 4-7 minutes. From Antony station to Orly South, the journey time is of 8 minutes approx. If you’re on the active side, you can use bikes to explore Paris and move around! It’s somewhat cheaper than using the other forms of public transportation in Paris. Vélib’ is a bike sharing system with docking stations all around the city. Check the map of the stations here. You can also check these tutorials before using the bikes. Remember the first 30 mins. are “free” and then you have to pay. If you got to your destination, look for a docking station, otherwise you’ll be charged. There are passes for occasional users that you can buy, which are convenient if you’re just visiting the city. V-Découverte: valid for 24 hours and allows you to take up to 5 Vélib’ at one time. It costs 5 €. V-Séjour: valid for 7 days and it allows you to take up to 5 Vélib’ at one time. It costs 15 €. Once you’ve bought your pass, these are the prices charged in case you use an elecrtic bike or you use the bike for more than 30 min. Even Arnold Schwarzenegger has used Vélib’ bikes! First things first, if you’re traveling with children to Paris and they’re under 4, transportation is free! For children between 4 and 11, there’s a half-price reduction. You can also buy a carnet for 10 trips at a reduced price, like we mentioned before. Now, there are also travel passes, cards and some other ways you can save money while using public transportation in Paris. This is perfect if you’re visiting Paris for a few days. Mobilis pass allows you to have unlimited travel for a day in the zone you choose, it’s a magnetic ticket and you must write your first and last name and the day’s date on the ticket when using it. You can use it in the bus, metro, RER, transilien, and tram. Mobilis pass can’t be used in the airport buses. The validity period of the travel passes starts at 12 am and ends at 11:59 pm. You can buy Mobilis in all metro, RER and tramway stations, and at all bus points of sales. How much does the Mobilis pass cost? If you’re staying in Paris for a week or a month (or forever!) you can buy a monthly or weekly Navigo package… it’s cheaper! Purchase them from ticket offices, machines in the stations or on its website. The Navigo pass allows you to use the public transport networks in the Île-de-France region: metro, RER, bus, tramway, and train (except Orlyval, SNCF train lines with reserved seating, and the Optile special fare lines). Tip: you’ll need a passport-sized photo for the Navigo pass. You can take a photo at the metro stations booths or bring your own photo! How much does the Navigo pass cost? Read carefully about the zones and specifications of the Navigo pass here. The Paris Visite allows unlimited travel on bus, RER, metro and tram around Paris and its suburbs, you also have access to the Montmartre funicular. Valid for 1, 2, 3 or 5 consecutive days. When you buy this pass the seller most of the times gives you a Paris Tourisme map and an SNCF map (if you don’t receive them, you can ask!). It can be purchased in advance here. Important: Fill in the date you decide to use it and the number of the card. The pass works for full days, not for hours. The day starts at 5:30 am and finishes at 5:30 am of the next day. So if you start using it at 6 pm, the day will still end at 5:40 am of the next day. RATP is a great addition to the apps on your phone. It’s a super complete app where you can find times and maps (in real time!) of the next metro, bus, RER, Noctilien, tram and even the airport lines. If you turn on your geolocation you’ll even be able to see all the stations available, including Velib and availability of bikes. When planning your itineraries you can find the best routes to take and even things to do near the stations. Download it for iOS and Android here. Citymapper works in many cities around the world. If you’re a frequent traveler, this app is a must! What’s great about Citymapper is that you can find the fastest route for where you’re going combining different services (not just public transportation). It also guides you around stations and you can get notifications if a line you’re going to use isn’t working. Listen, you probably already have this app in your phone so better use it! We’ve already written about how great is Google Maps to have offline maps available in your smartphone. The only thing you need to take into account when using this app to plan your itineraries is to check if the route really is the best. It has happened to me that Google Maps suggests a crazy expensive route just to be 5 mins. faster… which doesn’t make sense at all! Download it for iOS here. Now you’re ready to enjoy Paris like a true local! How will you move around Paris?